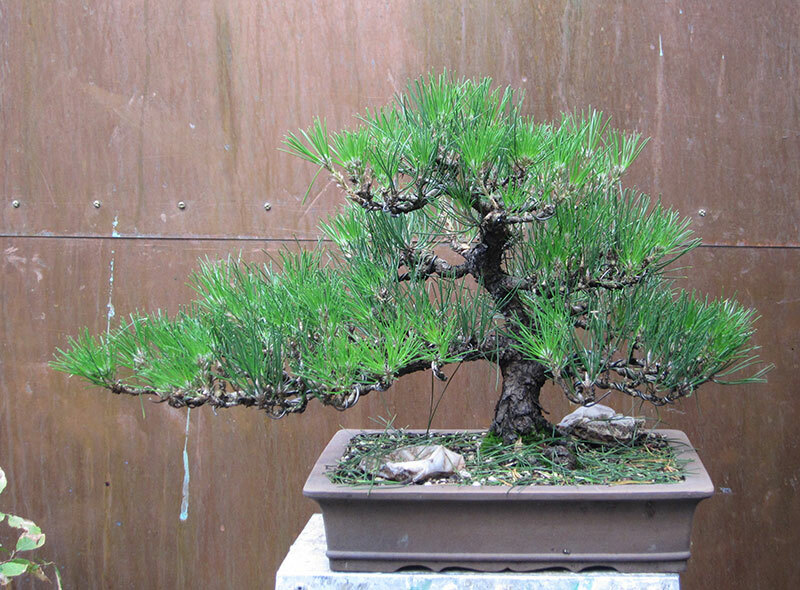 You are currently browsing the tag archive for the ‘Japanese Black Pine’ tag. Over the years while growing black pines I have always strived for more buds. Each year i tried to get back buds to form and most times I was successful although sometimes the tree I was working on would show signs of promise and then wave them in my face as it took them away again. What am I talking about? I am sure you have all seen them; those small buds that form and give you hope, only to swell but never open, and then after a few seasons growth, wither and die. A few of the buds in question. As far as i can work out, these are needle buds and or weak adventitious buds that for what ever reason can never really get themselves into gear. Even after candle pruning the rest of the tree theses buds often still sit and do nothing. The most frustrating thing about these buds is they always seem to appear right where you want them which makes seeing them die all the more difficult. I have tried a number of methods to awaken them but none have worked. I have had them in both shaded locations and spots where they get full sun, on bottom branches and in the apex, on strong growth and on weak. Nothing seemed to work no matter where they occurred or what I tried. But there is still hope. At the convention a month ago Ryan Neil talked about these buds and passed on a technique I had not heard of before. He said these buds could be awakened by slightly damaging them with a scissor cut done at the same time you candle prune. That is to say that when you cut the candles, you also make a small incision into these sleeping buds. He said it was this damage that would trigger these buds to put out a flush of growth at the same time as the cut candles re-grow their second flush. As we in winter at the moment I have not yet had the chance to try this method out, but I look forward to trying it this coming summer. Hopefully it is the answer to this annoying sleeping bud issue. Sometimes things elsewhere look better than what you might have at your own disposal. This can do two things. One is you can become inspired and in turn try to improve your situation, or you can feel defeated and do nothing and long for what is over the proverbial fence. 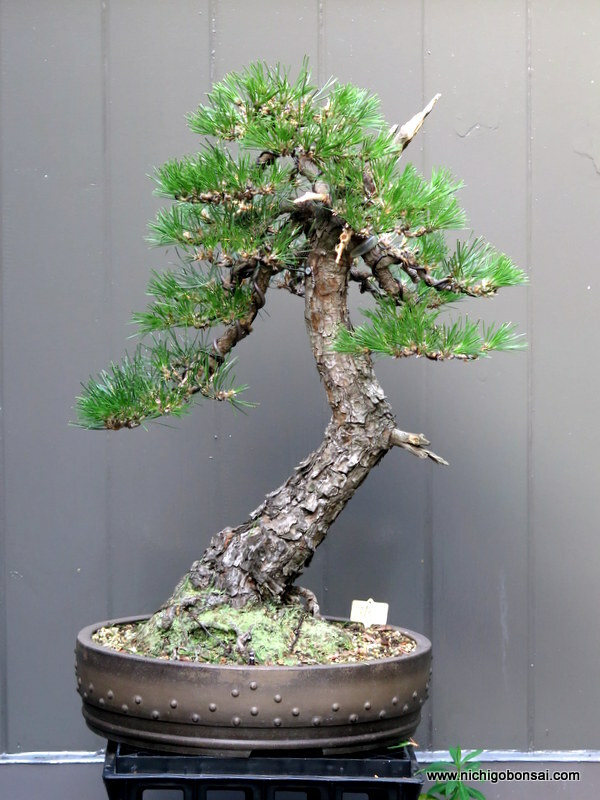 In terms of Australian bonsai we sometimes look over our fence (or ocean) and long for the material of Japan or the yamadori of America or Europe. Sometimes this inspires but a lot of the time due to Australia’s strict quarantine laws (making importing near impossible) and the fact that most native collectible material is protected by law it instills a feeling of giving up or accepting second best. 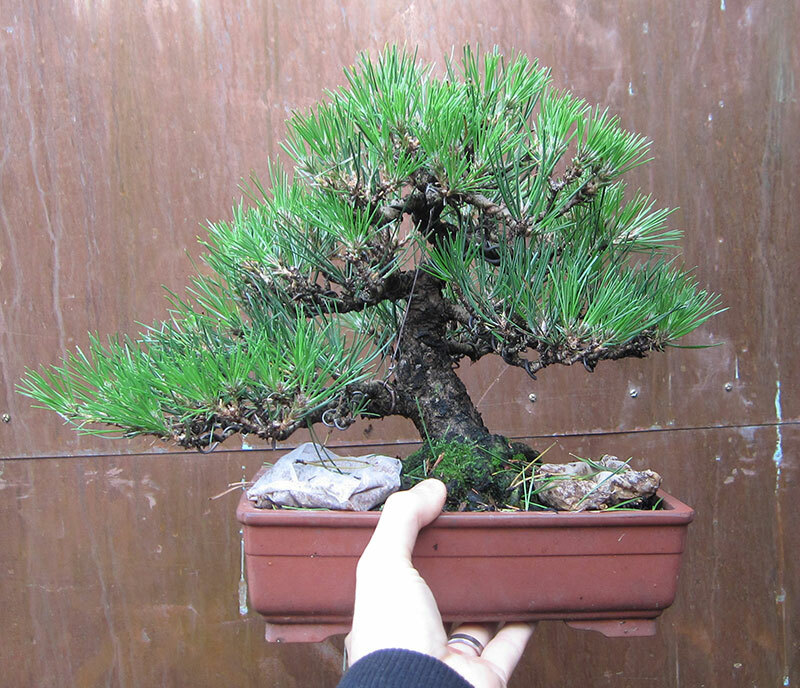 Myself, after returning from a trip from Japan, have looked over my collection and felt as if I was so far behind that I might as well sell up and take up stamp collecting when comparing my trees to Japan’s masterpieces and fantastic stock. I have done my share of moaning and complaining about what is available (or perhaps more importantly not available) but complaining doesn’t solve the problem. 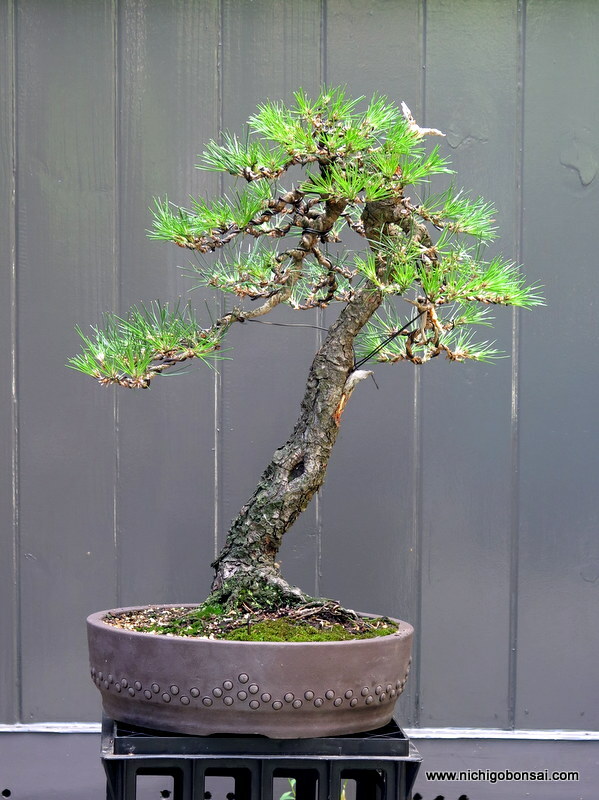 Australia doesn’t have juniper and pines as our native flora and those species we do have that do make good bonsai are often protected from collecting by law. 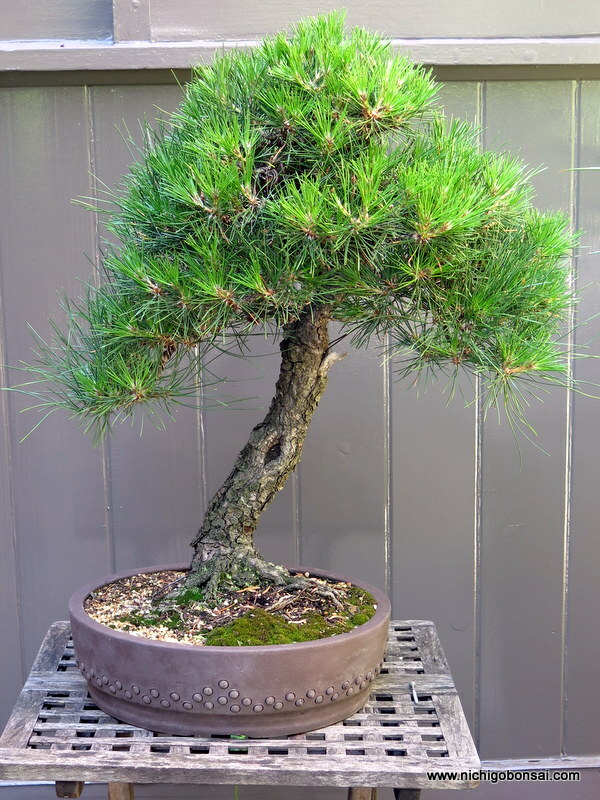 This combined with an import ban on most bonsai species puts the us on the back foot when it comes to yamadori. The best chances we have at material even vaguely similar is digging from gardens. So where does this leave us? We need to start growing more of our own. 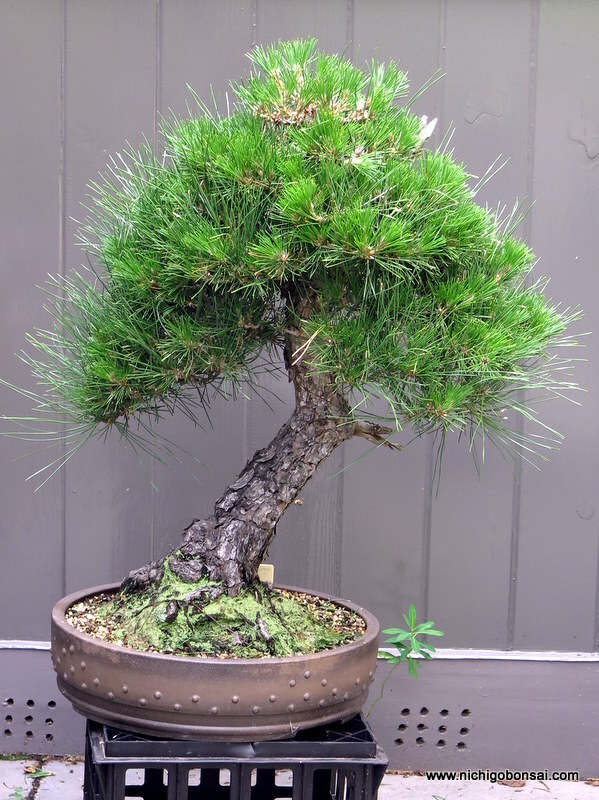 Taiwan produces ground grown or farmed junipers that for all intents and purposes look the same as their yamadori counterparts. 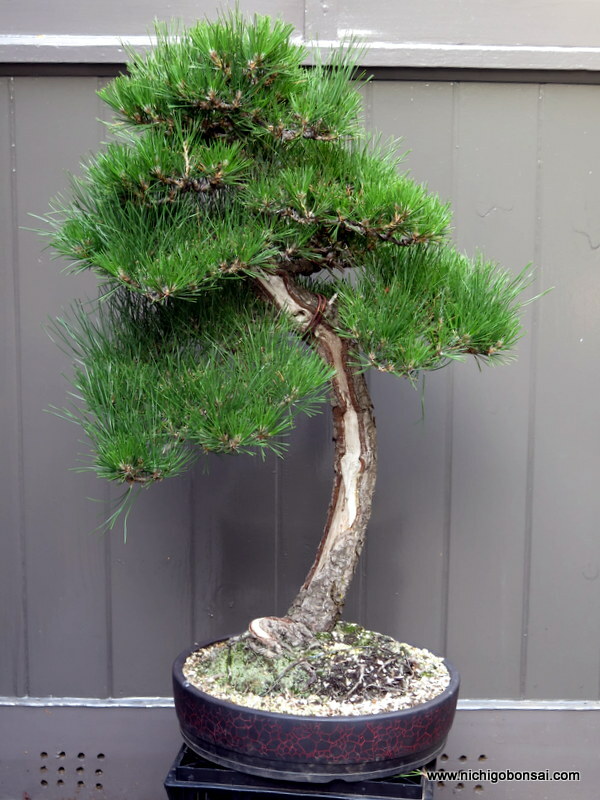 Japan produces tons of quality raw material in a massive range of species that ensures that there is always a healthy base of material being produced for future excellent bonsai. Growing material is not difficult, it just takes a little time. Most of this time is best invested early on in a plant’s life when it is young and flexible. 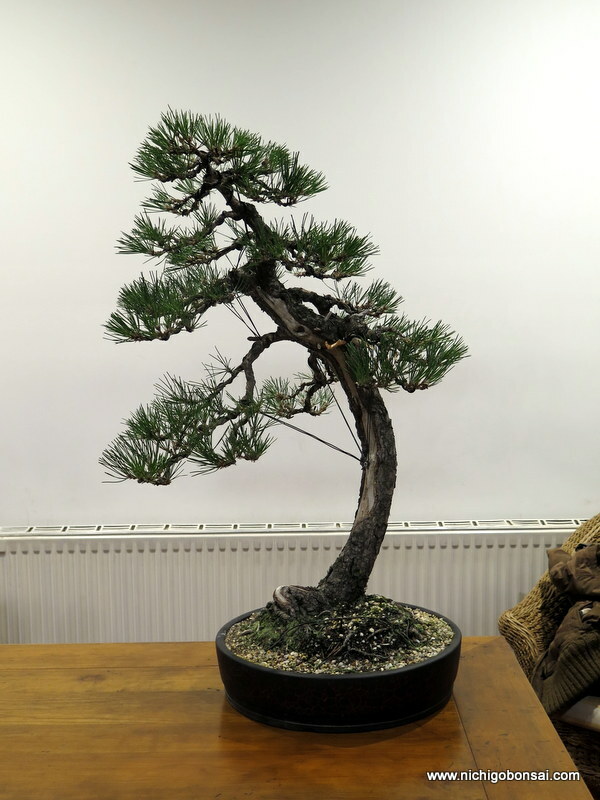 5 minutes to do some root pruning and another 5 minutes to wire the trunk for shape and you have the foundations for something interesting that has the potential to turn into an excellent bonsai. 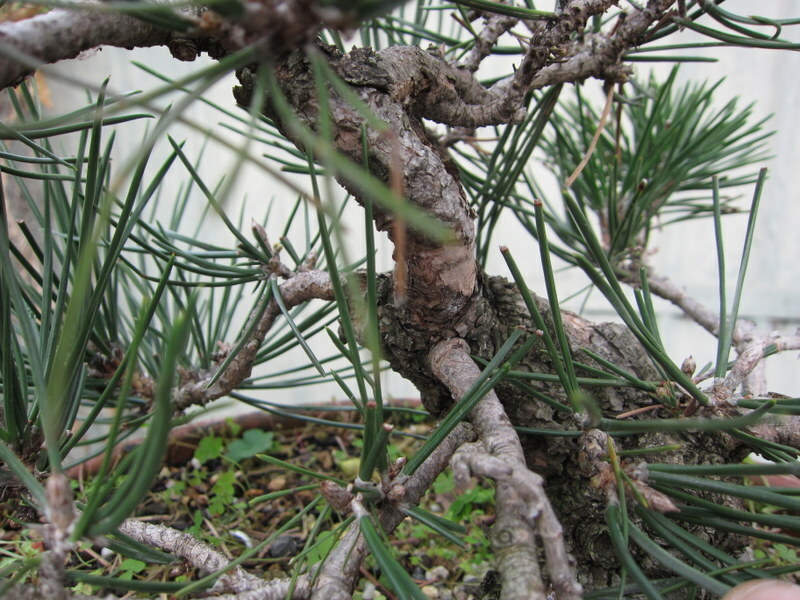 The above Juniper came from a grower in Shizuoka. While I was studying at the nursery we went on many stock buying trips and this tree was from one such trip. The grower was not a professional nursery man but rather a home grower. The rooftop over his small garden shed had been turned into a small stock production area. He grew stock and traded it with the nursery for pots and other trees, supplies etc. What surprised me was that this was a guy living minutes away from a nursery that sold stock and trees I could only dream of here in Australia, yet with all this stock at his disposal he still was growing his own, excellent material. If every grower in Australia, grew 5-10 good stock plants a year we would have so much good stock we wouldn’t know what to do with it all. This year I have finally decided to stop complaining about the lack of stock and making excuses about my lack of space and have planted 60 Trident maples and 60 Japanese Black Pines as a test batch. For some reason I had been making excuses over the last few years as to why I couldn’t get this process started. My backyard was too small, I didn’t have the time and I wanted to keep my collection at a small size etc. 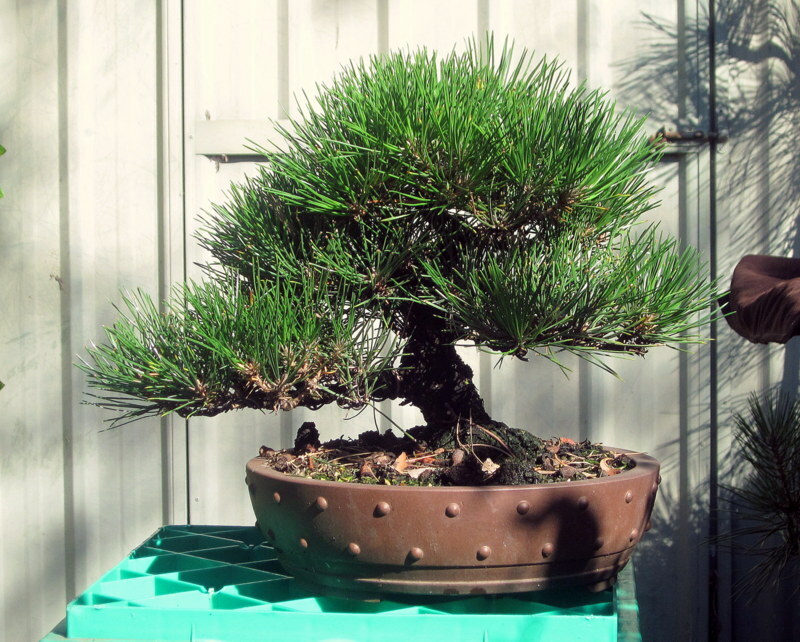 This year I decided that I could make room in my backyard, the time I needed was not all that much and that I could sell a good percentage of the stock once matured to keep the collections size down and to add some money to the bonsai bank. 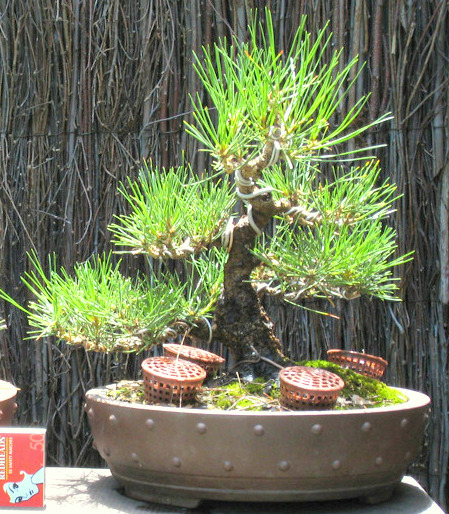 I decided that because space in my garden was at a premium, I would grow small bonsai stock. I don’t have a ground growing area so I also had to be able to grow in pots. 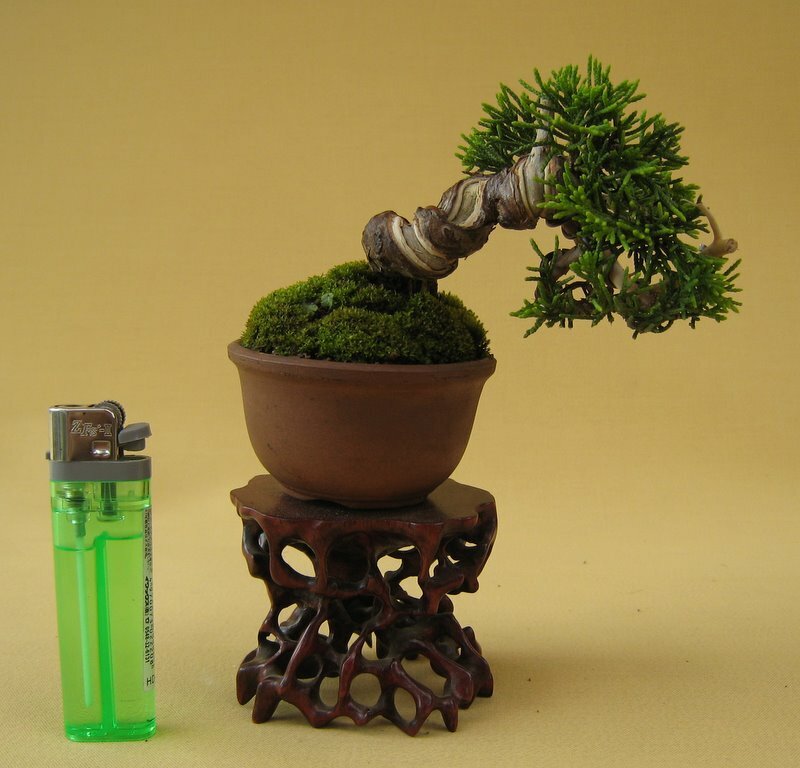 Growing small-sized bonsai made this an easy proposition. What I was hoping to achieve was similar to stock i had seen produced in Japan. 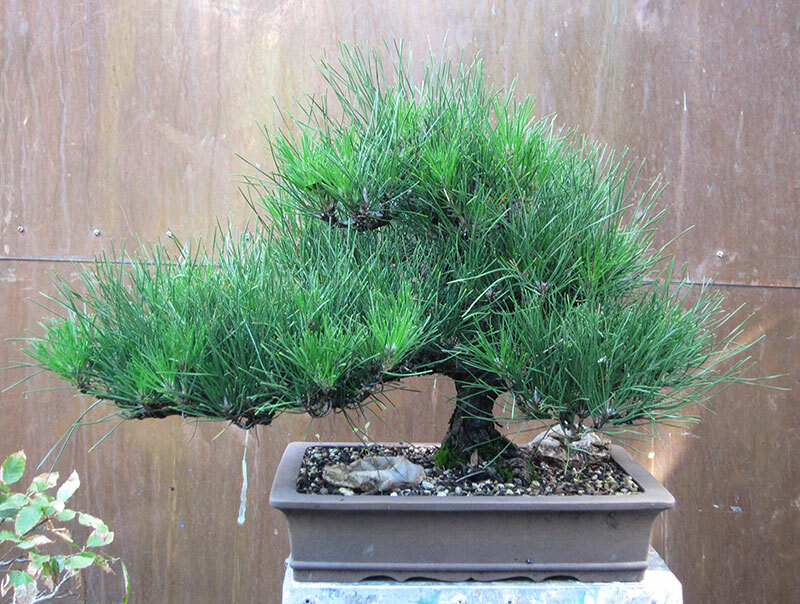 A Pine wired into an interesting shape. 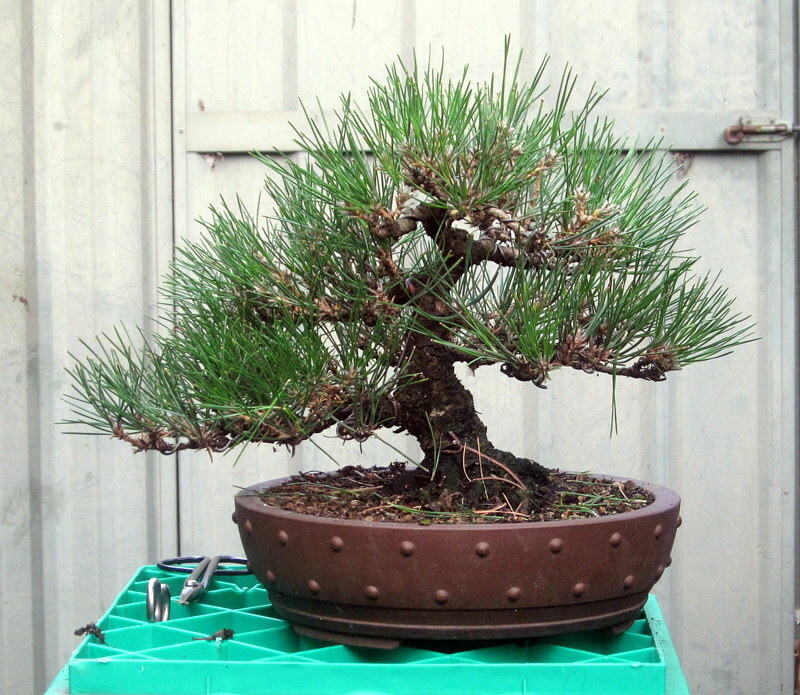 I am pretty sure that I can produce stock similar to the above pine from seed in 2-4 years. 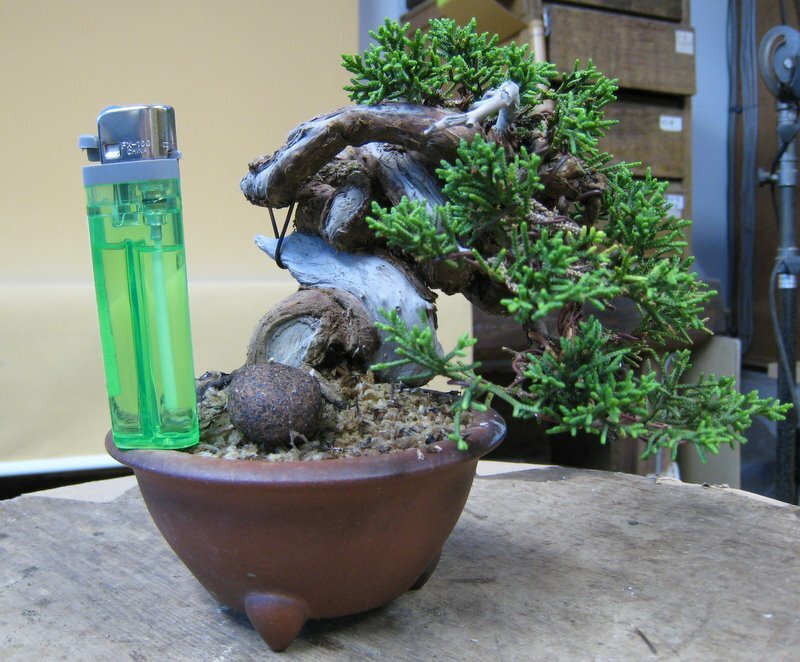 A juniper grown from cutting could save a year or two compared from starting from seed. 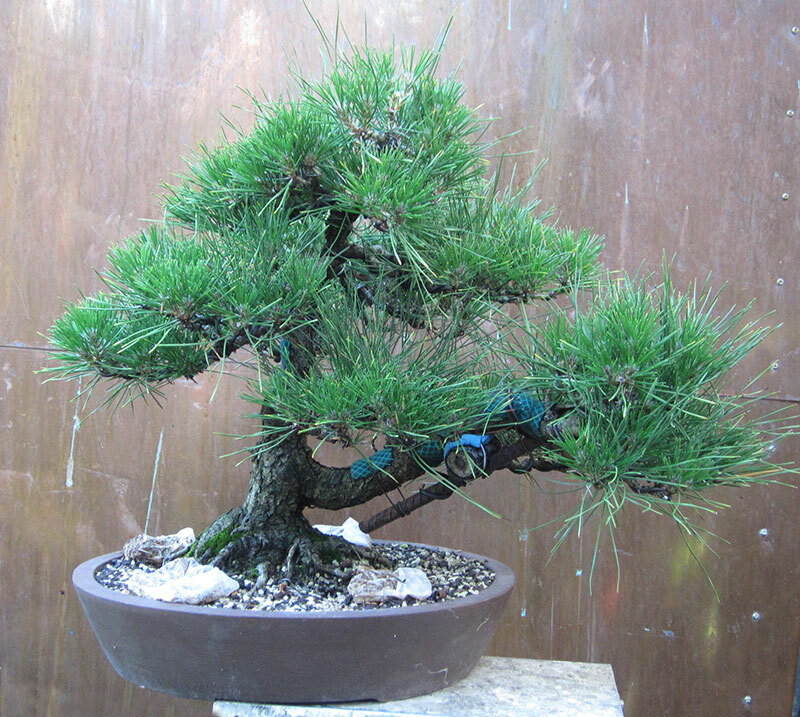 Junipers might be a little slower than some species but they do make very impressive small bonsai and are worthwhile to grow. A small kumquat. 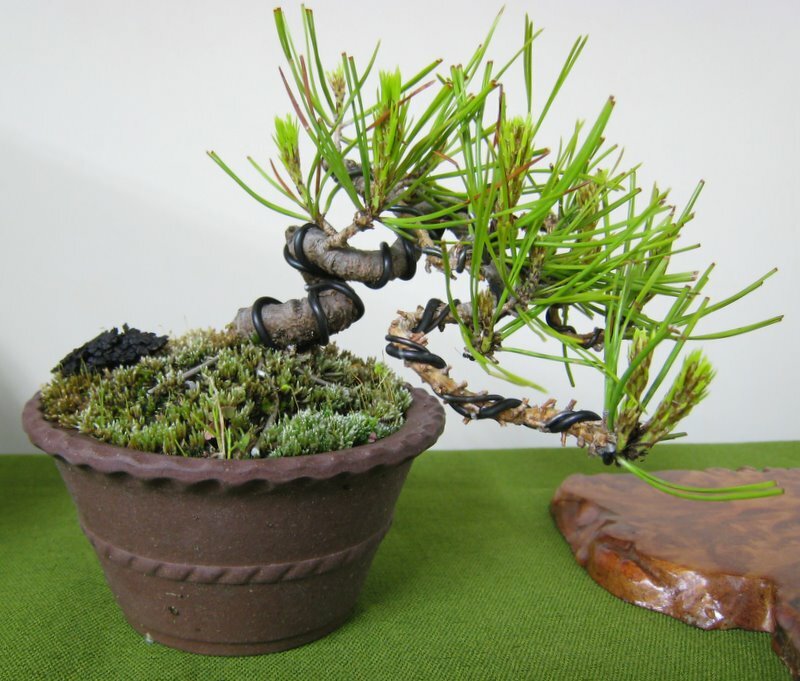 You don’t immediately think of deciduous or leaf species when you imagine twisted bonsai but they also make convincing and interesting choices for this type of bonsai. 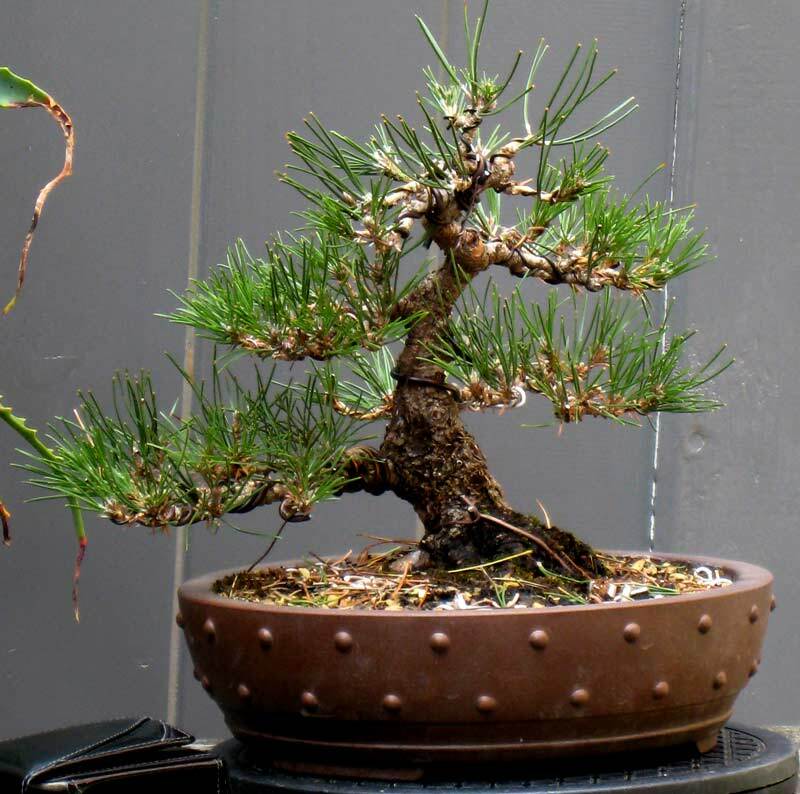 Using the above trees as my base inspiration, I decided for my test batch I would grow a mix of half deciduous and half conifer so I had some variation in the final bonsai. As I didn’t have any juniper cuttings, I struck some Japanese Black pine and Trident maple seed and potted them up individually. 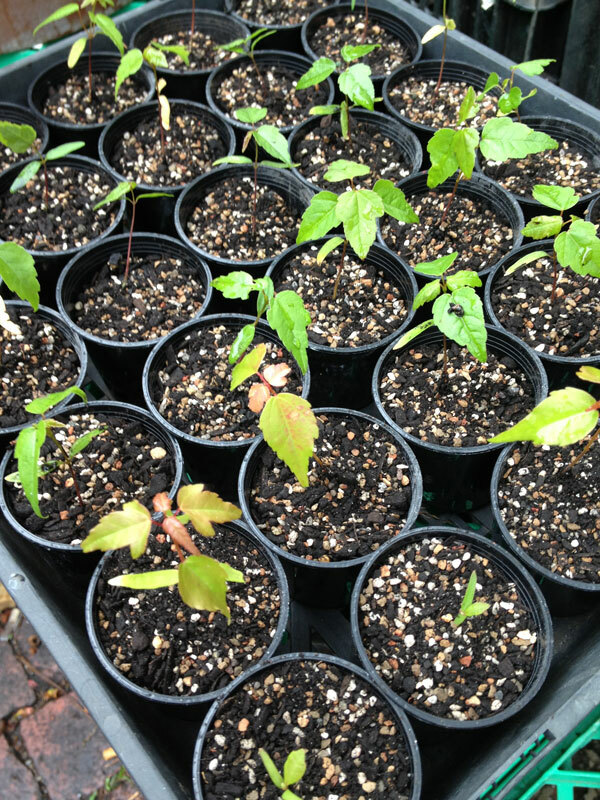 Trident Maple seedlings as germinated. 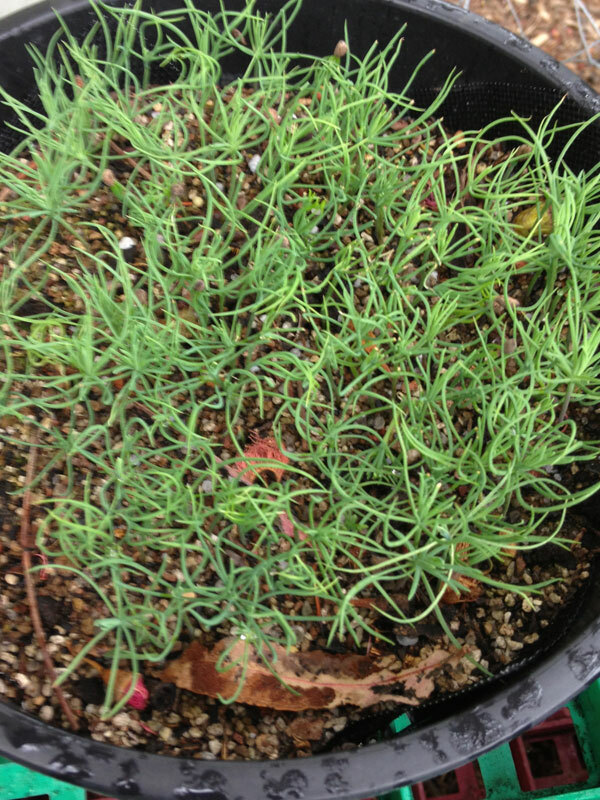 Japanese Black Pine seedlings as germinated. The removal of tap roots (encouraging lateral roots). A tray of 30 seedlings. 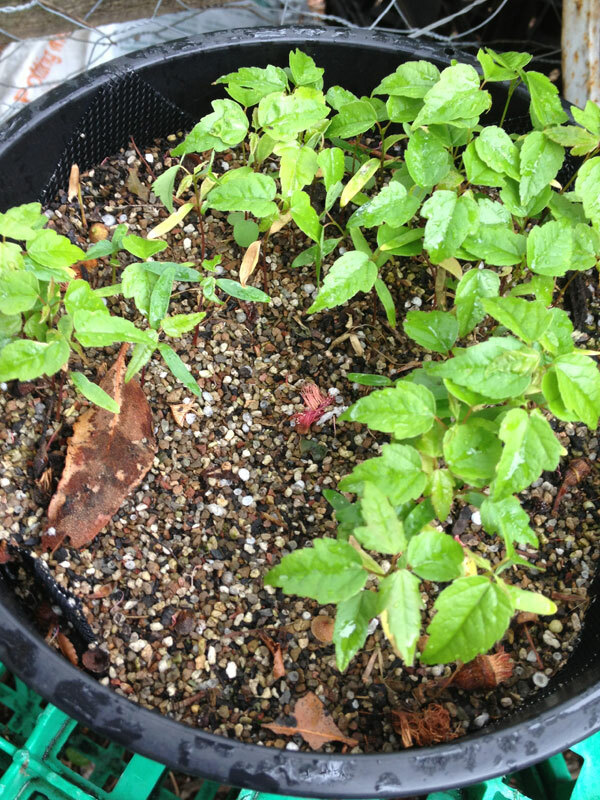 These seedlings need to re-establish and put on some growth before wiring. Pretty simple so far. The time spent on each plant to this point ran to the 5 minute mark (a generous estimation). Not a lot of time considering how much time will be invested in the future with watering, pruning and re-potting etc. After the seedlings have established and put on some growth I got some movement into them. This should take another couple of minutes per tree. The process is pretty standard really, insert the wire into the soil at about a 45 degree angle until it hits the side/ bottom of the pot. Then wire the trunk making sure that the wire is applied in even coils. Then you simply bend the trunk. The bends you put in the trunk should be tight and irregular. As the tree thickens the bends will soften in appearance so over exaggerate the bends at this stage. I try not to think about the final form of the tree at this stage rather I like to combine interesting kinks and twists and make each seedling different to the next. This means that come styling time I will have a range of shapes and styles to play with. I have also found that if you try to create styles at this stage you limit yourself somewhat. The more random you can make the trunks the more natural they seem. The times I have thought about their final form I ended up with many similar trees. They should now be fed and left to thicken for a year or two. Once the wire cuts in I will un-wire and depending on how the bends have set, I may re-wire again. Once i have them at pencil to finger thick I will start thinking about creating branching and small canopys. This should ensure that in a few years time I will have a lot of interesting stock to play with. Hopefully this post inspires a few people to have a go themselves. You don’t need a lot of space, ground or time and the rewards in a few years from such a small investment should be well worth your efforts. As I managed to get some time to work on my trees this last weekend, I though it was a good opportunity to do some grafting before my black pines woke up too much. 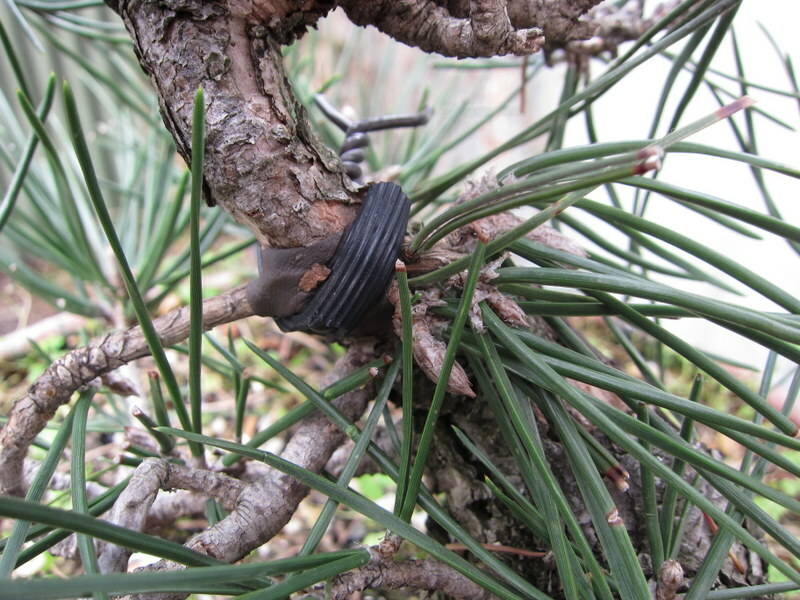 I like to do grafting on black pines just before they start moving in spring. 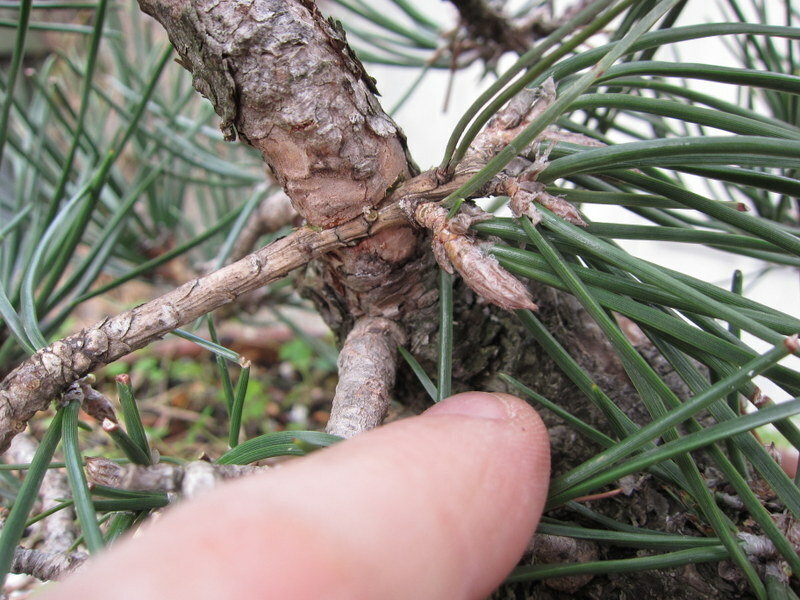 For bud grafting this is important as once the sap starts to move in a big way any cuts made to hold grafts tend to flood with sap before placing the scion which makes them a little less successful. Approach grafts on the other hand are a little more forgiving but if I can I try to do them around the same time so that the burst of energy that comes with the first flush of candles extending goes into healing the graft site. The graft site will be at the base of the thick bare section of trunk. I have decided to graft this tree as it has a rather large bare section of trunk. 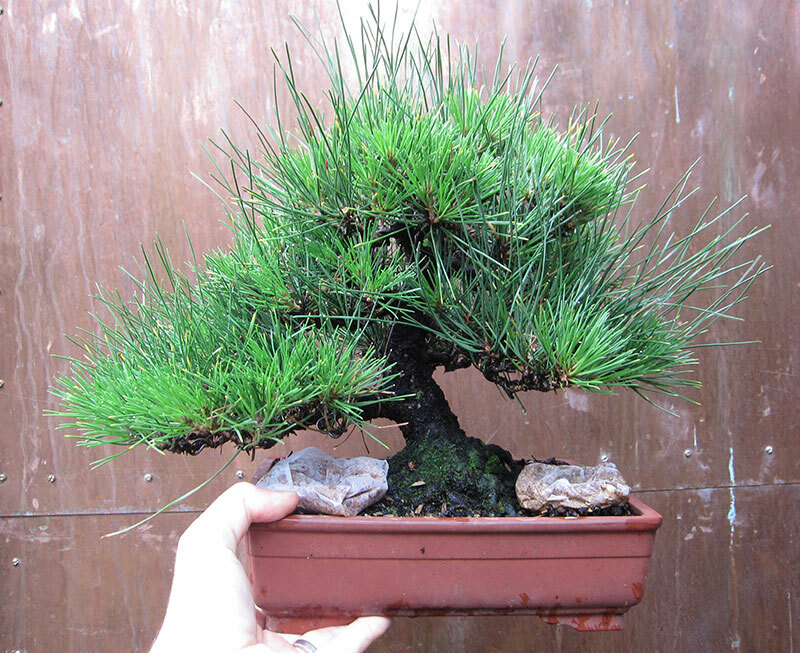 If I can graft a new leader to the base of this I can build a much smaller and more compact tree with the new graft’s growth. Obviously this will be a longer term project but I figure why go down a long road just to end up at a mediocre tree. If this graft takes and the tree develops as I imagine it will be a far greater result in the future than had I just persevered with the existing structure. The start of the process, a cut in the trunk. 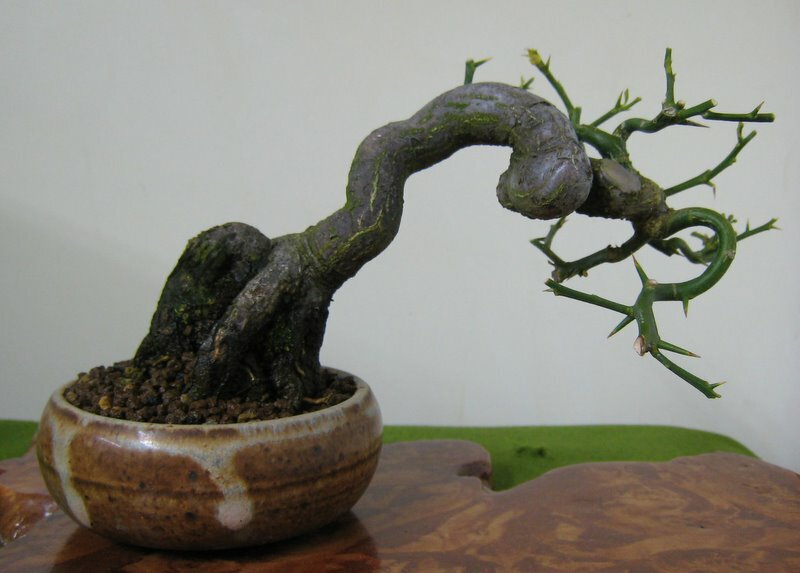 The first step is to create a cut for the graft branch to sit inside. I like to make the cut about 1/4 smaller than the branch that is going to be inserted into it. I start by making the cut with a small saw. I try to make the cut so that it is wider at the rear of the cut than at the front edge. usually this takes two cuts, one slightly slanted upwards and a second slightly downwards. This flared cut will help the scion branch to lock into the cut. Once I have made the first pass with the saw I clean up the cut with a knife so that I have clean and neat surfaces upon which the graft can be placed. 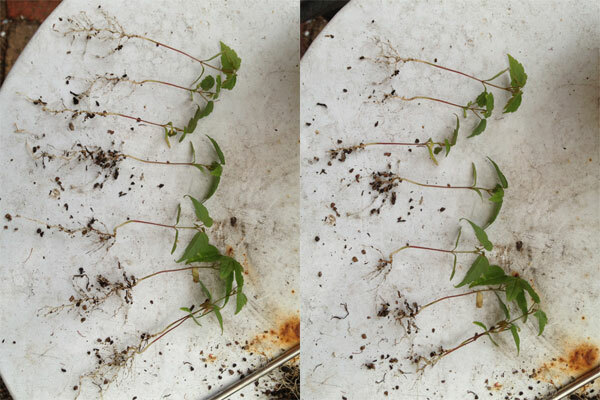 Some bark removed from the graft branch. Next I remove a small slither of bark from either side of the scion branch. Make sure that you check where to make these cuts prior to getting the knife out as it is important that these cut surfaces line up with the cut surfaces you made with the saw. I usually find that the knife cute that clean up the saw cuts combined with the cuts on the scion branch tend to eliminate the 1/4 under size that was initially cut with the saw. The Scion branch can now be inserted into the cut in the trunk. The fit should be snug and tight. Small adjustments might be needed to be made to the channel in the trunk to make sure things are all snug. If the channel is on the large side it is best to chock the scion branch so that it contacts firmly with the lower surface of the channel cut. (I use small twigs as chocks.) 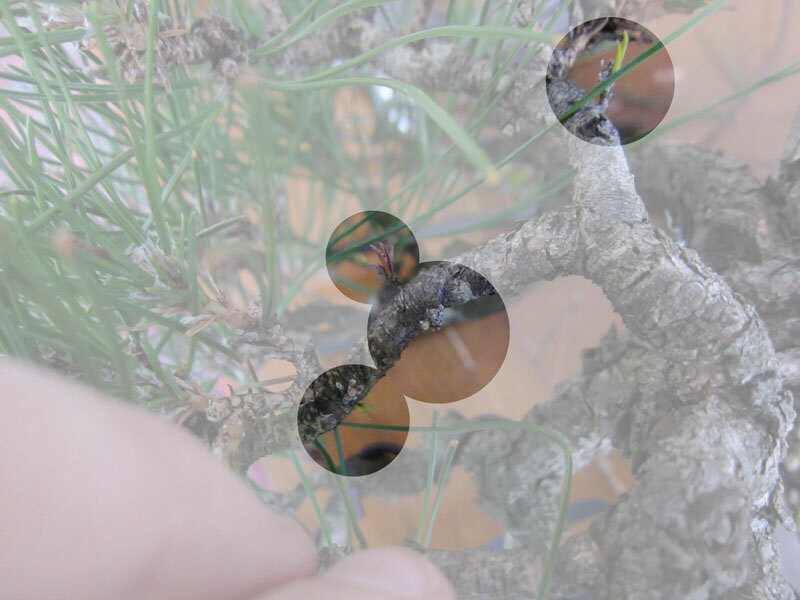 As sap runs from the roots up, contacting the lower surface will ensure that the graft has a better chance of taking than had it only contacted the upper surface. Either way, the scion should be firmly touching at least one cut surface on the channel in the trunk. Sealed and held tightly in place. Finally you simply seal the graft union and hold the scion firmly in place so that it cannot move and disturb the graft before it has had a chance to take. 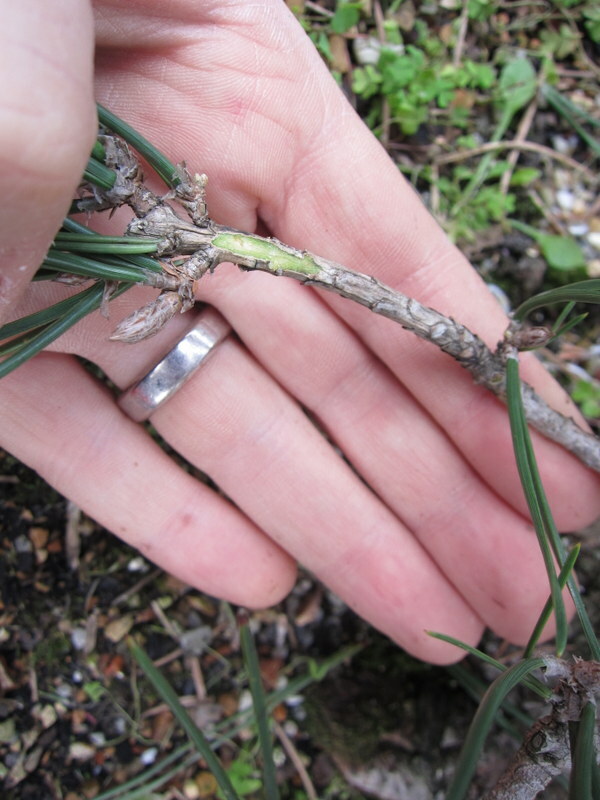 The speed at which the graft takes will depend on the amount of growth you allow to occur on the scion branch and above the graft site. 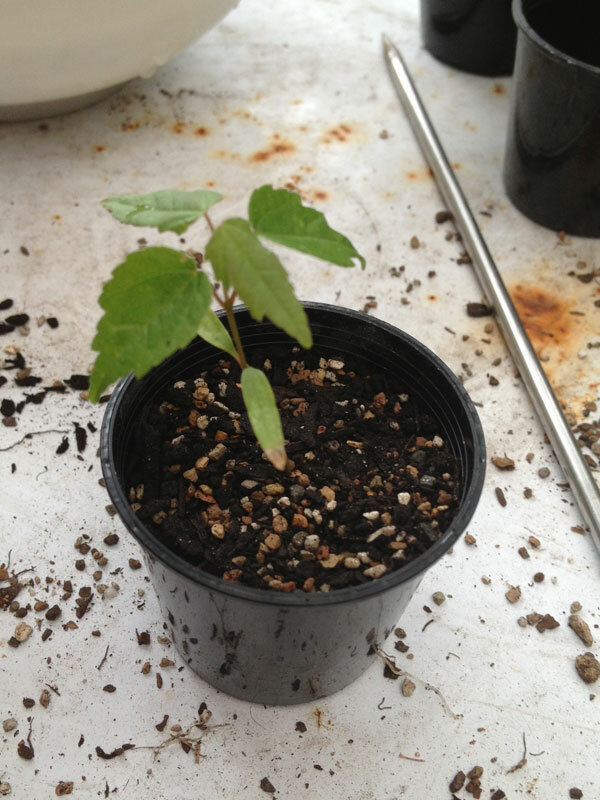 Obviously the more the trunk and scion branch grow and expand the more chance the graft has of taking. I would hazard a guess that this graft will be taken by the end of this coming seasons growth. Having said that I will probably cut off the growth above it in stages so it may be two seasons before I actually sever the scion branch from its original source. It has been a busy couple of weeks. Autumn has begun and with it a range of seasonal tasks. 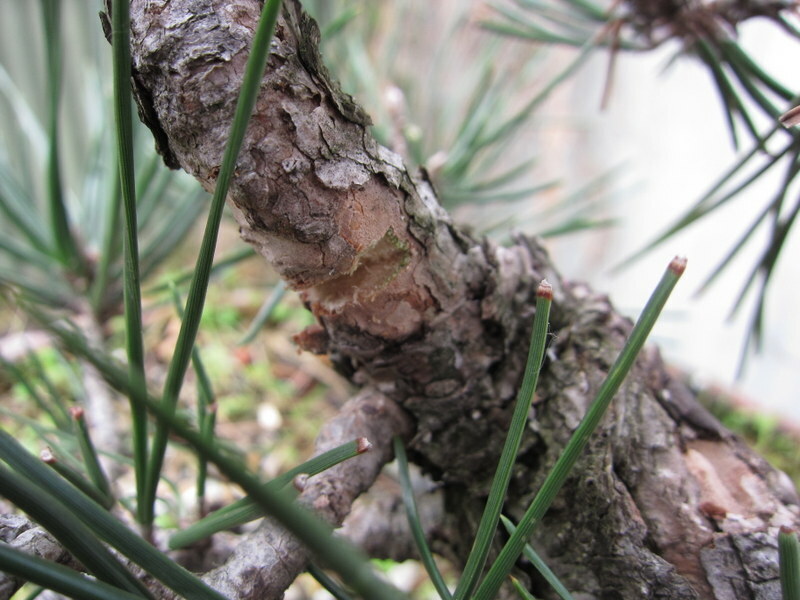 I have been madly plucking Japanese black and Red pine needles. Here in Melbourne we have a convention coming up for which I have to prepare a few trees so I tried to get my needle work out of the way early on. It took a long time this year. What hadn’t really dawned on me until now was that needle pruning takes more and more time each year. Now this is not a bad thing, its more a by-product of a successful technique. As ramification increases, so does the amount of needles you have to remove. Where last year I was removing needles from one candle there are now two candles at that location that need needles removed from them. Not only are there more needles to pluck, but also the space you have to pluck them in becomes more and more cramped forcing you to use tweezers to negotiate the cramped conditions. 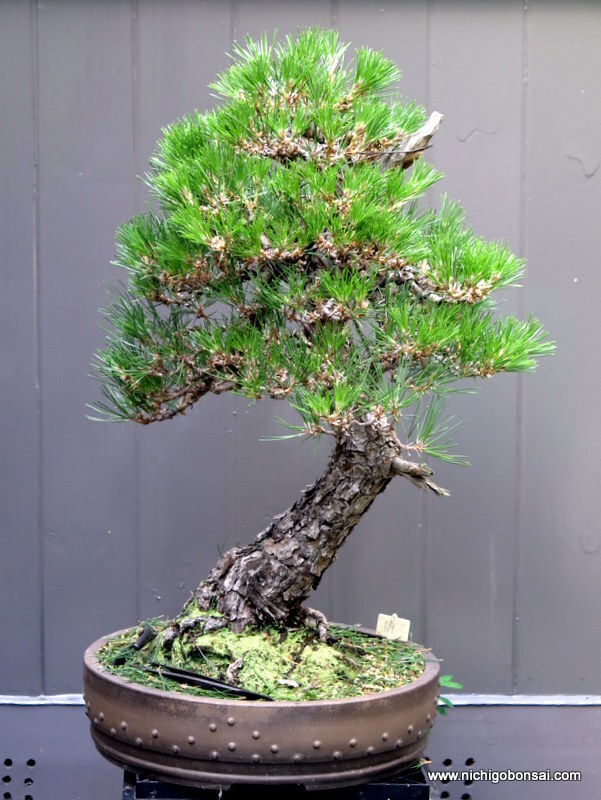 The above tree has wholly been grown in Australia and has come great leaps and bounds since I learnt how to properly care for it during my first trip to Japan. It is becoming a nice little tree although it is not perfect and it bears the marks of many of my early mistakes. That being said it has taught me a lot and although I have though about selling it on a couple of occasions I think now I would find it a little hard to part with. After all I have invested a huge amount of time into it. Perhaps this is something to keep in mind when deciding on how large your collection should grow. How much time do you have, and will this time be enough to maintain your trees to a high level? Bearing in mind that as your trees improve and refine, in turn their maintenance times increase. 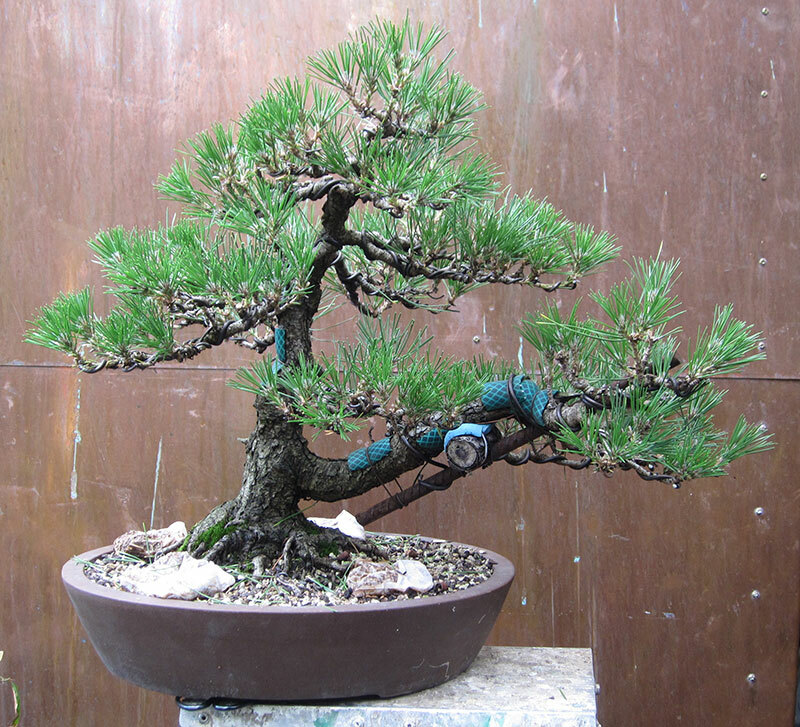 I really enjoy growing pines but I am very aware of the time I have to spend on them each year. Needle plucking, pruning, wiring and candle work all add up. On a tree that is starting to get refined I am guessing I would be sending 6-10 hours on each of them over the year. When you add up all the pines you grow and then the time you spend on them, combined with the tasks you have for all other species you grow you begin to realise that there is a limit to how many trees you can look after to a high level. I lean towards keeping a smaller collection that is well maintained rather than a larger collection that doesn’t get the attention it deserves. That said it is hard to turn down a good tree.